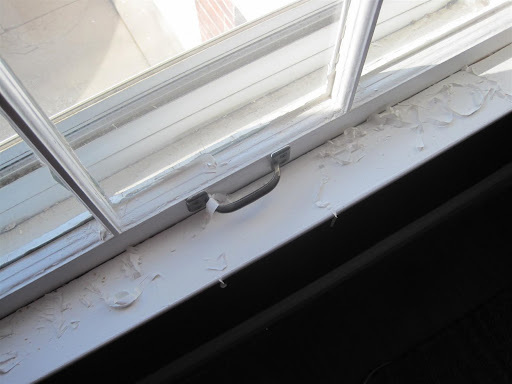 Before I could put up the pretty bamboo shade I bought on Overstock.com, I had to address the crumbly, yellow and downright sad window in the art space. 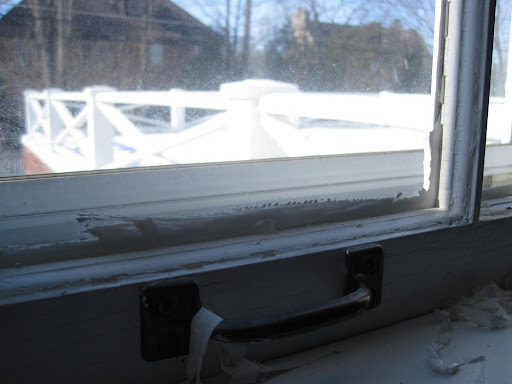 This window is in fine working order, but unfortunately was a huge eyesore due to bad paint jobs and general neglect. 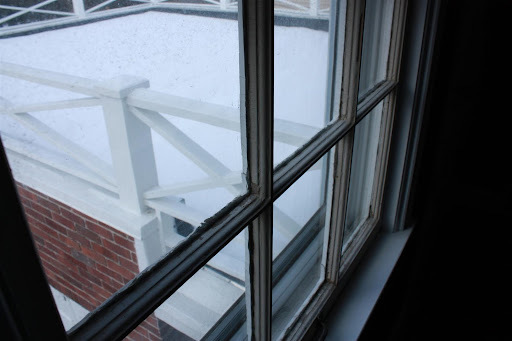 It is missing chunks of wood and glazing, and really needs to be redone when it gets warmer out. Until I can do some structural work, a new coat of paint was necessary to stop the assault on my eyeballs. And your eyeballs. Because your eyeballs are the whole reason I have this blog! See, I painted this window for YOU! 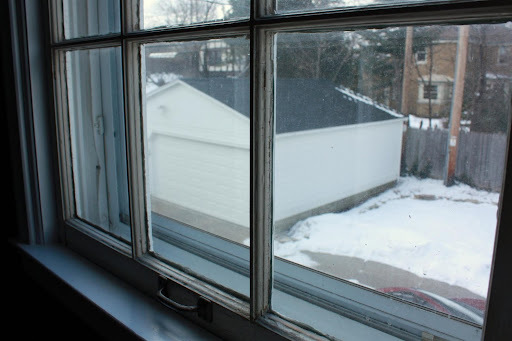 I usually use BIN primer on windows, but I had a gallon of BEHR 'Premium Plus Ultra Paint And Primer In One' that our painter used on our living room windows. I thought I'd sand everything really well, and give this product a spin instead of using a separate primer. It wasn't half bad! It is definitely not as good as using shellac-based BIN to seal up the wood and smooth over bumps, but it did the job. And this was just about looks, since I'm going to take my time with this window later on. When I paint windows, I always run the paint onto the glass to create an extra 'seal' between the glass and the wood. Oh my, the up-close shots are still not too pretty. Just pretend there is another coat and it's lovely, ok? Oh, and also pretend that I have cleaned the glass. Also pretend that I have cleaned the outside glass on every window in our house since we moved in. Ahem. The day after painting, I come in with my favorite tool, the glass scraper. 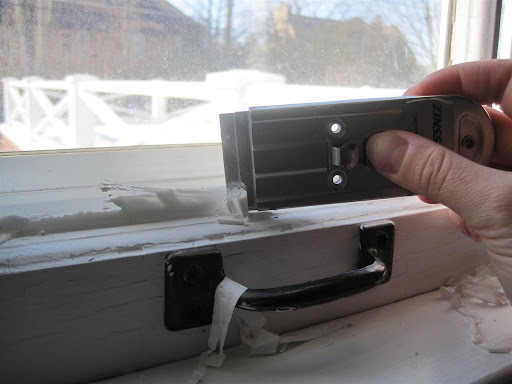 If you can rest your hand against the sill or frame and keep it steady, it is quite easy to scrape the excess paint away in long strips. And the bonus is that you make all this fun 'latex confetti' that you can throw up in the air while singing and dancing to "The Safety Dance" give to your cats to play with! Actually, they might eat it, so just do the 'confetti' thing and not the 'plaything' uh, thing. Once I was able to get a coat of fresh white paint/primer on the window, I felt ok about installing my bamboo shade. I try not to HIDE bad things with pretty things, you know? It's all about homeowner integrity. Just don't peek underneath all our ceiling medallions. This shade is rad. If you are in the market for some shades, Overstock.com beat Home Depot's price by 8 bones, and there are many more styles and sizes on Overstock. 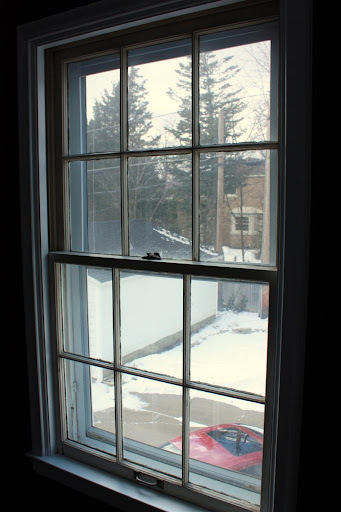 The inside of my window is 29.5 inches, and trying to find a 29-inch shade was difficult. I left several stores pretty disgusted and had to soothe myself with a Starbucks. See, Home Depot cost me 4 bucks and I didn't even buy anything there! Well, my coffee habit is neither here nor there. I'm mighty happy with the way the window shaped up. The fabric is from Joann's Home Decor section. I can't find it online, so I don't have the link. Again, here is the link to the shade I purchased. I think I should be getting a little kickback from Overstock at this point, don't you? I am adoring your curtains. Did you do those no-sew? They look great. And, I recently discovered Behr Premium Plus, I adore it. I just painted the kitchen this week and it was my first rodeo with BPP. A-freakin-mazing. Those panels are gorgeous!! I wish I could bring something that bold into our home! I am in LOVE with those curtains! Fabulous!!! 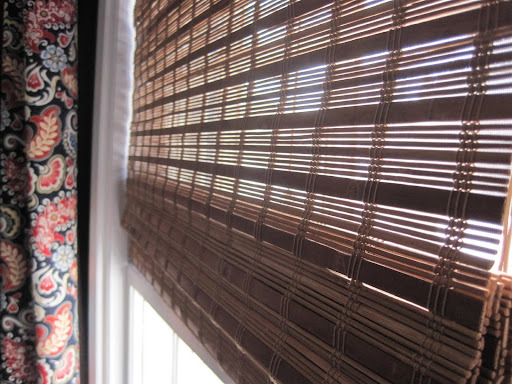 And I am obsessed with bamboo shades - good to know about Overstock.com - we have some crazy sized windows, too! And I'll admit to being ridiculously lazy about scraping excess paint off windows. After all the tedious painting, I am OVER it. But now that you've shown me the correct tool to use... sigh... I think I'm inspired. Enough rambling from me - bottom like - LOVE the whole window makeover! I am so not a fan of paisley anything... Normally... BUT I totally dig these drapes! Beautiful colors, they really make the wall color POP! Love the fabric! You and I are kindred spirits with the window painting with the BIN primer and glass scraper. But I will admit if I never have to paint another window I will be so happy. You make it look like a lot more fun! I LOVE your drapes. Can't wait to see the finished room. O I just knew you were going to do something fab with that material!! Oh my gosh, I want to bear the children of those drapes. So incredibly pretty! And they just go so well with your wall color! 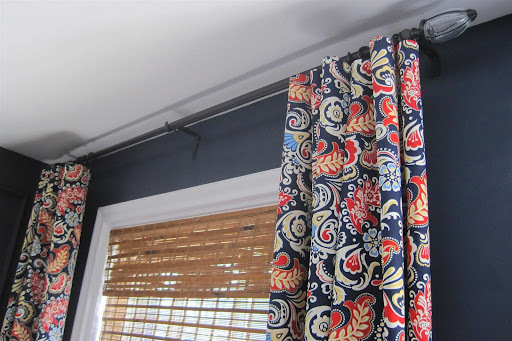 I absolutely LOVE the fabric that you used for the drapes - they are so perfect with that wall colour! Can't wait to see the whole room completed! Ok...just picked my jaw off the floor. I love that fabric!! So I have to admit I hate Behr Premium Plus. I bought it to use in our basement office. I was going to just prime and then paint, but the people at Home Depot convinced me this would be the better option. Well, I had to do two coats anyways (had to buy another can) costing me alot more time and money than I wanted. I know that you just did a bunch of work getting the windows ready for the shades... but those curtains totally stole the show. I love them! Kim, yes they are no-sew! Thanks to everyone who likes the fabric, the name on the receipt is FC Besame Fiesta. Funny, huh? And for those who commented, the Behr premium plus worked well for what I used it for, however I'm not sure I would pay the extra money if I was just using it for walls. I'm actually very happy with the regular Behr paints, they are thick and cover well.